A new report has found that 1.5 organizations fall victim to ransomware attacks every minute — and more than $1 million is lost each minute due to cybercrime. RiskIQ’s 2018 “The Evil Internet Minute” investigated the cyber threats that organizations and internet users face every minute. The report found that cybercrime costs businesses $600 billion each year, with ransomwarespecifically costing corporations $8 billion per year, or more than $15,000 per minute. In addition, there are 1,274 new malware variants released each minute, 22.9 phishing email attacks per minute and 2.9 billion record leaks from publicly disclosed incidents each day (that’s more than 5,000 each minute). The data also showed .17 blacklisted mobile apps, .21 new phishing domains, .07 incidents of the Magecart credit card skimmer, .1 new sites running the CoinHive cryptocurrency mining script and four potentially vulnerable web components discovered during the evaluation process. “This data shows that as organizations continue to roll out new digital strategies and initiatives, the new digital assets they create are subject to scores of malware, malvertising, phishing and crypto mining efforts on a massive scale, while rogue apps, domain and brand infringement, and social impersonation cause business disruption and material loss,” according to RiskIQ. The company noted that the instances of these cybercrimes have gotten worse since last year, showing that companies need to do more to protect themselves and their clients. “When brands understand what they look like from the outside-in, they can begin developing a digital threat management strategy that allows them to discover everything associated with their organization on the internet, both legitimate and malicious, and monitor it for potentially devastating cyberattacks. However, bringing the massive scope of an organization’s attack surface into focus is no easy task,” the company added. Were You Attacked Today With Yesterday’s Hacking Technique? We’re all familiar with the idea of recycling as a means of reducing the waste stream. Most of us are in the habit of separating our paper, plastic, glass and metal trash from other garbage. What you may not know is that recycling is a major trend in the hacker community, too. Many of the data breaches that have struck in recent years were accomplished using software that has been around for a long time — today’s hack, yesterday’s technique. This large-scale recycling program means there is an abundance of bad actors spreading an abundance of viruses, trojan horses, ransomware and other junk intended to wreak havoc and steal money and intellectual property. One recent example of recycled software getting heavy use by the hacker community is Mimikatz, a tool used to capture passwords, user credentials and other sensitive information from Windows-based operating systems. Mimikatz was first created in 2007 and since then has been instrumental in a number of large-scale malware attacks, including the NotPetya campaign that disrupted networks and commerce during the summer of 2017, costing affected companies hundreds of millions of dollars according to the tech journal eWeek. Mimikatz was also used in the PinkKite attack that infected retail point-of-sale (POS) systems, primarily throughout Europe and North America, stealing credit card data used in consumer transactions. There are other common tools, many of which were developed for legitimate purposes, that have been co-opted by the hacker community in many malicious hacking campaigns. Microsoft originally created PowerShell to automate administrative tasks in Windows. Now PowerShell is available as open source code, supporting Linux and macOS, and available to the developer community — including hackers. PowerShell has been a key component in attacks using stolen passwords and digital credentials to give hackers access to and control of networks. PowerShell was used in the REDLeaves attack, discovered in 2016, targeting the health care and energy industries. PowerShell was also part of a state-sponsored attack targeting teams participating in the 2018 Winter Olympics. Likewise, macros are small, code-based shortcuts developed for the Microsoft Office suite of products and are used to execute larger, more complex functions. Macros make life easier for Office users, but they have been adapted for spam attacks where they are embedded in attachments that look like legitimate files. Once clicked, the macro downloads malware to the victim’s computer, infecting it with whatever code the adversary wants. Macros were behind the Locky ransomware attack that bedeviled hospitals in the U.S. and elsewhere in 2016 by encoding important files that the hackers would only release upon receipt of payment in bitcoin. While this illicit activity has contributed to the relentless assault on personal and corporate networks, it has one major flaw that chief information security officers (CISOs) can exploit to protect their networks and endpoints. Because so many hackers conduct campaigns using recycled code, mass-marketed malware and reused techniques, the number of attacks has increased. But that also makes it possible, with the right security strategy, to identify the key signatures in those campaigns and thwart such attacks before they are successful. The NotPetya and PinkKite campaigns targeted two different kinds of systems. 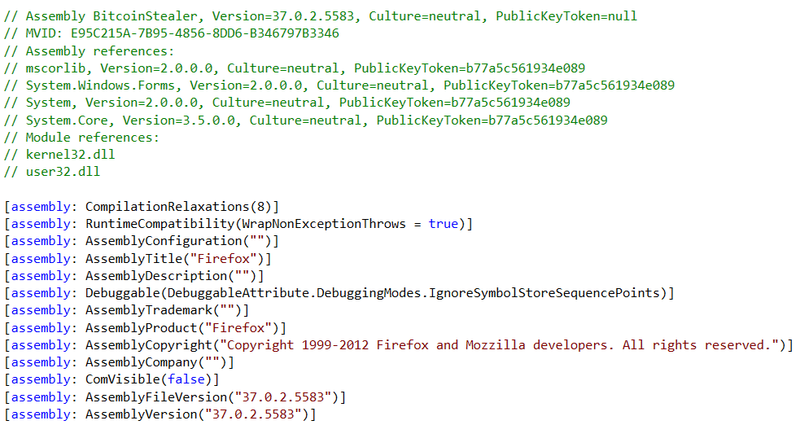 Both used Mimikatz because it worked well for the job it was designed to perform. There was no reason to invent, test and try a new tool for stealing the credentials essential for their hacks because Mimikatz was already available. Because both NotPetya and PinkKite used Mimikatz, defenses configured to detect their telltale signatures would have been able to detect its presence. Security teams which used such defenses were alerted to an attack and with this knowledge could have quickly intervened to thwart the campaign and prevent infection. This is not revelatory. I previously wrote about an entire information/cybersecurity industry sector built on the collection, analysis and use of this information known as threat intelligence, as a key part of a cyber-defense strategy. Knowing this, why aren’t more organizations taking advantage of this major flaw in the hackers’ use of recycled and open-source code? The information security industry may be too focused on generating fear, uncertainty and doubt than in helping companies establish the security priorities needed to bring to bear all the capabilities available to them. Because of the adversary’s reuse of hacking tools, CISOs should make sure their systems are calibrated to not only detect the newest zero-day threats but also thwart the malware and methods that continue to wreak havoc on their networks. The information security industry is turning the corner in its fight against the global hacker community, and keeping pace with the threat means building on what we already know. After all, the key to stopping tomorrow’s hack can often be found in the lessons learned from yesterday’s attack. If corporate America, government entities, and hospitals weren’t enough, now ransomware developers are attacking Golf! According to a report from GolfWeek, computers at the PGA of America’s offices have been infected with ransomware. The victims learned they were infected on Tuesday when ransom notes started appearing on their screen. Based on these strings and the misspelling of “algorithm”, PGA of America was most likely infected with the BitPaymer ransomware. This is the same type of ransomware that recently hit the Alaskan town of Matanuska-Susitna and forced them to use typewriters for a week. As already stated, based on the reported ransom note, PGA of America was most likely targeted by the BitPaymer Ransomware. BitPaymer has been around for a while, but typically keeps a low profile. There has been some moderate activity, though, with Bitpaymer over the last few weeks though as shown by the ID Ransomware chart below. Like SamSam, BitPaymer tends to target organizations by hacking into Remote Desktop Services connected to the Internet. Once inside a network, they traverse through it and encrypt every computer they can get access to. Recent variants have been appending the .locked extension to encrypted files and dropping ransom notes of the same name as the encrypted files but with “.readme_txt” appended to it. For example, an encrypted file called test.jpg would also have a ransom note named test.jpg.readme_txt. You can see an example ransom note for the BitPaymer Ransomware below. Notice the strings in the example below match those mentioned in the GolfWeek article. All files on each host in the network have been encrypted with a strong algorythm. Backups were either encrypted or deleted or backup disks were formatted. Send 2 different random files and you will get it decrypted. It can be from different computers on your network to be sure we decrypts everything. Files should have .LOCK extension of each included. 2 files we unlock for free. BitPaymer is also known to charge very large ransom amounts to decrypt computers. 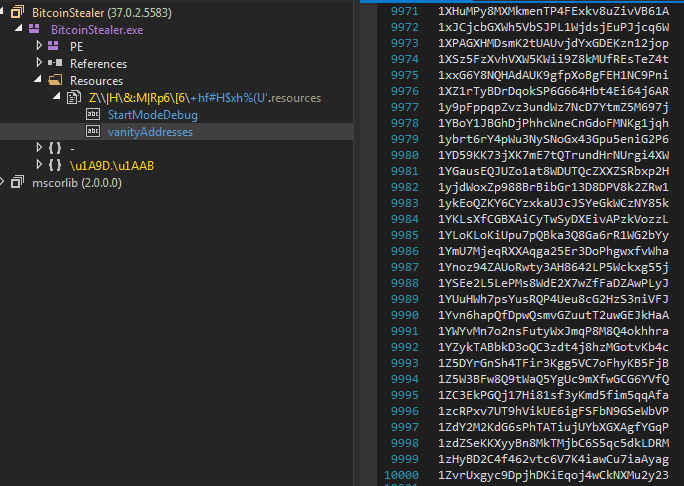 For example, one BitPaymer infection in the past asked for 53 bitcoins to decrypt an entire network. Unfortunately, BitPaymer is a secure ransomware, which means either PGA of America is going to have to restore from backup or pay a hefty ransom payment. Update 8/9/18: Article updated to clarify that the PGA of America’s computers were infected and not PGA Tour. Over a billion worth of cryptocurrencies have been reportedly stolen this year so far and we continue to see reports of crypto theft daily. Every time a huge cyberheist is reported cryptocurrency prices slump but they remain attractive to cybercriminals looking to capitalize on its growth potential. This week, the SonicWall Capture Labs Threat Research Team has come across a crypto-stealing malware which monitors the victim’s clipboard to watch out for cryptocurrency wallet addresses. Once detected, they will change the clipboard data with their own address. Unless the user is vigilant and carefully examines the address after they paste it, the transaction that happens after, will go to the cybercriminal’s address instead of the intended recipient. 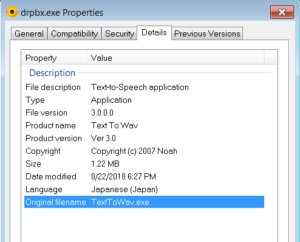 For more savvy users, looking at the file properties reveal that it pretends to be a text to speech application with an internal name of texttowav.exe. During analysis, we noticed that this sample is packed using ConfuserEX and the main module is named “Bitcoinstealer” which establishes the real purpose of this malware. Facebook was hit with a double privacy punch regarding data privacy on Wednesday. First, Facebook acknowledged in a public post that one of the apps on its platform, myPersonality, inappropriately shared 4 million users’ data with researchers. Also on Wednesday, The Wall Street Journal reported that Facebook pulled its data security service, Onavo Protect, from Apple’s official App Store after Apple said that the app violated its data collection policies. The news comes as privacy experts are pushing the social media giant to double-down on its efforts around social media data privacy – especially on the heels of its backlash around the Cambridge Analytica scandal in March. The recent incidents also reveal a behind-the-curtains look at how the giant is still struggling to navigate data privacy. Facebook VP of Product Partnerships Ime Archibong said on Wednesday that the company will ban an app called myPersonality and notify the roughly 4 million impacted users after discovering that the app had misused information collected from them. “Today we banned myPersonality — an app that was mainly active prior to 2012 — from Facebook for failing to agree to our request to audit and because it’s clear that they shared information with researchers as well as companies with only limited protections in place,” Archibong said in a post. MyPersonality is a Facebook app, created in 2007, enabling users to participate in psychological research by filling in a personality questionnaire, and then also offered users feedback on their scores. David Stillwell, the creator of the app, did not respond to a request for comment on the situation from Threatpost. Facebook did not specify what specific data was passed to researchers, and where the specific violations occurred. There is no current evidence that myPersonality had accessed the Facebook “friends” of those impacted – though that may change, Facebook said. But apps passing data to outside third parties is a sore spot for Facebook. In March, the company’s firestorm around data privacy and misuse started with an app developer violating the company’s platform policies by collecting data via an app under the pretense of using it for psychological research – and instead passing users’ personal information to Cambridge Analytica and its parent company SCL. myPersonality is only one of many apps that the company has looked at – Facebook said that since March, it has investigated thousands of apps, and suspended 400 of those due to concerns around data misuse and user data privacy. Interestingly, last week one of those initially suspended apps, Crimson Hexagon, announcedthat it has been un-suspended from Facebook’s platform. Facebook, in July, said it had suspended Crimson Hexagon due to concerns about the collection and sharing of data. The company launched an investigation into the Boston-based company’s collection of public user data was a violation of its policies concerning using data for government surveillance. Fast forward to last week, Crimson Hexagon announced that it has been re-instated on Facebook and its customer base will now be able to once again access those data sources. In another turn of events around data privacy, Facebook’s data security app Onavo Protect was pulled from Apple’s app store after the phone company said it violated its data policies, according to The Wall Street Journal report. Onavo Protect is a mobile VPN app that encrypts users’ personal information and monitors their data to help customers manage their mobile data usage and limit apps that use lots of data. Onavo Protect, which was acquired by Facebook in 2013 and alerts customers when they visit a potentially malicious website, was collecting and analyzing users’ behavior to understand customer activity outside of Facebook’s app, the report alleged. According to the report, Onavo Protect violates Apple’s developer agreement preventing apps from utilizing data that is not relevant to the their purpose. The app also did not follow new rules that Apple unveiled earlier this summer to limit developer data harvesting. Onavo Protect’s website shows that the app is still available on Android. Healthcare lags behind other major industries in its phishing attack resiliency rate, which measures the ratio between people who report a phish versus those who fall victim to one. Healthcare trails other major industries in its phishing attack resiliency rate, which measures the ratio between people who report a phish versus those who fall victim to one, according to a report released Sept. 17 by Cofense. The healthcare resiliency rates for the last 12 months was 1.49, compared with an average resiliency score of 1.79 for all industries examined by Cofense (formerly PhishMe). By comparison, the energy sector had a resiliency rate of 4.01, the insurance industry had a rate of 3.03, and the financial services had a rate of 2.52. The data is based on phishing simulations that Cofense uses to test employees at customer organizations. “One factor that surely inhibits the industry’s resiliency: high turnover. With physicians, registered nurses, and administrative staff constantly churning, it’s hard to gain traction in the fight against phishing,” the report commented. The top five phishing scenarios that healthcare workers most frequently clicked on were Requested Invoice, Manager Evaluation, Package Delivery, Halloween eCard Alert, and Beneficiary Change. “The healthcare industry knows better than most that phishing is a serious problem. But the industry is still playing catch-up in phishing resiliency,” the report noted. Unfortunately, phishing has become the preferred method for hackers to get access to healthcare organizations to steal valuable medical data. The 2018 Verizon Data Breach Investigations Report (DBIR) found that phishing and financial pretexting represented 93 percent of all breaches investigated by Verizon, with email being the main entry point (96%). Phishing is also a way attackers deploy ransomware, which has devastated the healthcare industry over the last couple of years. The Verizon report found that ransomware accounts for 85 percent of the malware in healthcare. In a phishing campaign, an attacker poses as a legitimate person or entity in an email to get the target to provide valuable information, such as credentials, or click on a link that results in ransomware being downloaded on the victim’s machine. It only takes one person to fall for the bait for an entire organization to be infiltrated. According to an American Medical Association and Accenture survey of 1,300 US physicians, 83 percent of respondents had experienced a cyberattack and more than half of those said the attack came in the form of a phishing email. Nearly two-thirds of all the physicians who experienced a cyberattack experienced up to four hours of downtime before they resumed operations, and approximately one-third of physicians in medium-sized practices that suffered a cyberattack said they experienced nearly a full day of downtime. More than half of the physicians were very or extremely concerned about future cyberattacks in their practice. In addition, physicians were most concerned that future attacks could interrupt their clinical practices (74%), compromise the security of patient records (74%), or impact patient safety (53%). Data from Wombat Security’s learning management system revealed that healthcare industry is one of the worst when it comes to data security knowledge, answering 23 percent of IT security best practice questions wrong on average. The Wombat learning management system includes questions about avoiding ransomware attacks and identifying phishing threats, two topics dear to the heart of healthcare CISOs. The primary purpose of a phishing attack is to gain a foothold inside the organization by infecting a computer or other endpoint. To combat phishing, organizations need to train employees on how to spot and avoid phishing emails. They also need to adopt security best practices and deploy appropriate technology to lessen the chances that a phishing attack will succeed.